So you want to make your pet a star! Registering your pet/s is easy - click here to sign up and add a cute photo and personality description. Share your page on social media and encourage your friends and family to help your pet’s rise to fame AND fundraise for RSPCA South Australia. All money raised from Adelaide’s Next Top Pet goes straight to helping rehabilitate and rehome less fortunate animals in South Australia. The Top 10 fundraisers will be invited to compete at the catwalk event being held at Published Arthouse. You have until Sunday, 3rd of March 2019 to fundraise your way into the top 10 – good luck! The highest fundraisers by Sunday, 3rd of March 2019 will be crowned in first, second and third. They will be invited to join the top 10 fundraisers and walk the catwalk at Published ArtHouse in front of our celebrity host and judges - Channel Seven presenter, Amelia Mulcahy, Aussie Dog Guy, Ryan Anderson and Writer and Director, Leela Varghese. The judges will crown fan favourites and give away lots of fun prizes! The catwalk show will feature live music, dancers and a bucket load of furbabies. Everyone and anyone is invited to come along and support our top 10! Amelia is Channel Seven Adelaide’s weather presenter and hosts a segment with Today Tonight called ‘Pet of the Week’. Amelia is dedicated to ensuring that all rescue animals are welcomed into loving homes. 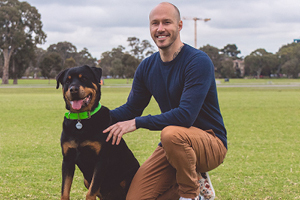 Ryan, known as Aussie Dog Guy, is an animal Inspector by day and animal guru by night. He’s mission is to protect and improve the lives of neglected and homeless dogs. He is also an avid RSPCA foster carer. 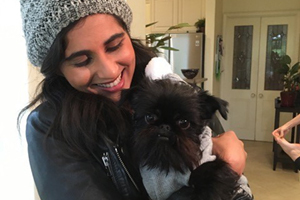 Previous TV personality, Leela, is writing and directing her current web series about insta-famous dogs in Adelaide, Leela is definitely qualified to select Adelaide's Next Top Pet. Thank you to our existing Adelaide's Next Top Pet sponsors - check them out here.